Shop Cafeteria Tables: Enjoy Our Great Selection! 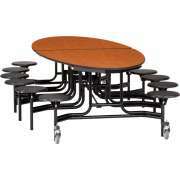 Your students and staff will eat in comfort when seated at sturdy, attractive cafeteria tables from Hertz Furniture. With a variety of styles, colors, sizes and seating options, you can find the perfect arrangement for your eating space. The Hertz Design Team is here to help you determine the optimal choice to suit your needs and budget. 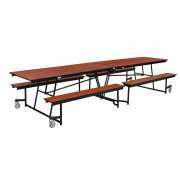 Our cafeteria tables are designed with the needs of a busy lunchroom in mind. They are easy to clean and feature effortless folding, compact storing, and smooth mobility when not in use. 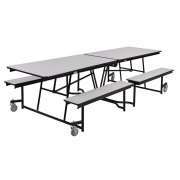 Increase mealtime efficiency with our dependable lunchroom tables. What is the best size for a cafeteria table? 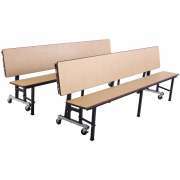 We offer classic rectangular school cafeteria tables in different lengths with various surface and edge materials. This way you can choose whether you prefer to have a few very long tables or a lot of smaller tables. The surface and edge materials have varying degrees of strength and durability. While some materials might cost less in the short term, in the long run better materials provide increased longevity. Special edge banding is a worthwhile investment because it keeps away germs and prevents food from building up and corroding the table surface. Within the rectangular options, there are a number of excellent choices. To display your school pride, custom models are available with your institution’s logo printed on the surface. Many models are also available with a choice of surface, edge and frame colors so you can coordinate your space or choose a colorful variety. 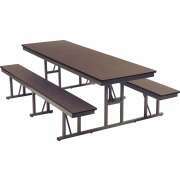 What is the best kind of seating for a lunchroom table? Traditional lunchroom tables have built-in bench-style seating. While this is an excellent option, there are additional choices to choose from. You may prefer a cafeteria table with attached stools or chairs. The benefits of these options are that every student has a clearly defined space to sit, and each seat has separate entry points. Chairs swivel around so students can easily turn to face the principal or teacher during lunchtime announcements. The cafeteria bench tables option offers maximum versatility. This unique style provides two flexible arrangement options. 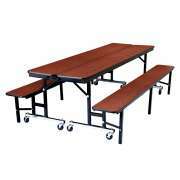 For classic style school lunch tables, simply combine two units. To use this convertible option as a bench, simply flip the table top over and you have an instant bench with back support. This arrangement is a great choice if you like to use your cafeteria as an assembly hall as well. Can you get cafeteria tables without benches? You don’t have to choose a classic table setup in order to get a great selection. For those who don’t want attached seating, plain cafeteria tables without attached seating are available. This option lets you choose any kind of chair. Hertz Furniture also has preschool picnic-style bench tables so little ones can sit comfortably at appropriately-sized tables during lunch time. 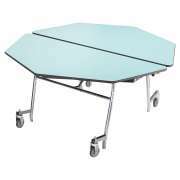 What is the best shape for a cafeteria table? For an alternative to the classic rectangular configuration, circle, square and oval models are available. 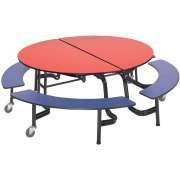 Circular lunchroom tables create a more intimate and friendly feel because students seated around the table can see each other easily. Oval tables enable students to sit closer together so they don’t have to yell in order to have a conversation. 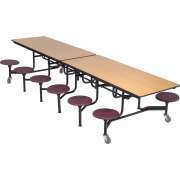 Most of our lunchroom tables fold for easy cleanup and mobility. Many lock in a partially-folded position, providing access to the floor under the table for easy cleaning, without requiring the table to be completely folded or moved. 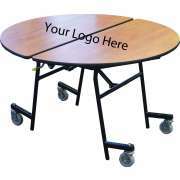 Folding cafeteria tables lock in the fully-folded position and roll out of the way on attached wheels. 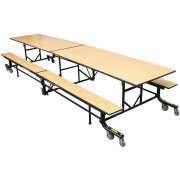 Hertz Furniture has a huge selection of cafeteria tables from leading manufacturers such as Midwest Folding Products, National Public Seating and Amtab. You can choose a few tables of the same style, or break up the monotony with unique shapes and colors. Whatever you need to properly furnish your lunchroom, Hertz Furniture will help you find the perfect option for your space and student population.